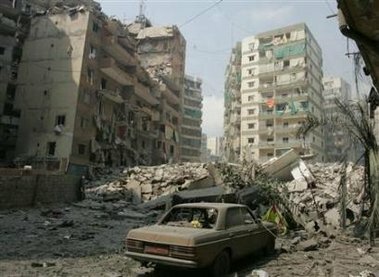 The Israeli attack on Lebanon has entered its second week and the death toll now stands at about 300, nearly all Lebanese civilians. The humanitarian crisis continues to worsen with hundreds of thousands of people displaced from their homes. For a report from Lebanon on the crisis we turn to journalist Robert Fisk. He is the chief Middle East correspondent for the London Independent and has lived in Beirut for over two decades. He is author of “Pity the Nation: The Abduction of Lebanon.” His latest book is “The Great War for Civilisation: The Conquest of the Middle East. We reached him Tuesday at his home in Beirut. He spoke about the Israeli assault on Lebanon, Lebanese Prime Minister Fouad Siniora, the role of Syria and Iran in the crisis, embedded reporters in the Israeli military and more. AMY GOODMAN: For a report from Lebanon on the crisis today, we turn to journalist Robert Fisk. He’s the chief Middle East correspondent for the London Independent. He’s lived in Beirut for almost three decades. He’s the author of Pity the Nation: The Abduction of Lebanon. His latest book is The Great War for Civilization: The Conquest of the Middle East. We reached him late yesterday at his home in Beirut. He spoke about the Israeli assault on Lebanon. ROBERT FISK: What’s happening is obviously the mass punishment of a whole people, the Lebanese, in response to the capture of two Israeli soldiers and the killing of three others on Wednesday of last week. The death toll now has just topped 240 in the last few minutes. We’ve — almost all of the Lebanese dead are civilians, of course, as usual. The Americans, in the usual pusillanimous way of Mr. Bush, are doing nothing to prevent this from taking place. It amazes me — I mean, living here in Beirut, as I have for 30 years. Here are the Lebanese people, sophisticated, educated, cosmopolitan, people who don’t look like the Arab world, they look like us; I mean, people who could be quite at home on the streets of Paris or New York and London, and some of them are; people who read, who are very well educated; people who speak English fluently, French beautifully, and fluent Arabic, as well, of course; and who, when they die in such large numbers, the best we can produce is a call for restraint by the State Department and a claim by the British, our own dear Tony Blair, that the Israelis are using disproportionate force. The exchange rate for neutral slaughter between Israel and here at the moment is now 1 to 10. 24 Israelis – I think 25 now — to 242 Lebanese, many of whom, as I say, most of whom, but a far larger proportion of civilians. Many Beirut people were very moved Saturday when the Lebanese Beirut newspapers carried a very, very tragic picture of a young girl, a little girl — must have been 4 or 5 years old — near a place called Ter Hafra, lying dead in a field in her blue pajamas, looking, as I said in my newspaper, very similar to that terrifying picture from Poland in 1939 of a little Polish girl lying dead with her weeping sister beside her. I did receive a phone call today from an Israeli woman living in the East Coast of the United States, who said she thought that what was being done to the Lebanese was unforgivable. I thought she was a very generous and good woman, saying she prayed for the Lebanese people and the Palestinians, and for the Israelis, of course. But it’s a tragedy of immense proportions, because it’s also tearing apart a country. In the last 24 hours we found the Israelis have turned to attacking a milk factory, Liban Lait — it’s actually the producers of milk I drink every morning in my tea — a paper box factory, for heaven’s sakes, hardly a terrorist target. We’ve already seen them smash up the runways of Beirut Airport and destroy part of the — most of the lighthouse, the new Manara lighthouse, in Beirut. The Israelis today even attacked the factory which imports Procter & Gamble goods here. We’ve had an ambulance convoy, a convoy of new ambulances from the United Emirates, cross from Syria into Lebanon, got attacked from the air. It’s an all-out war against the economy infrastructure of a country that was at last beginning to look modern again, after the 15 years of civil war, which cost 150,000 lives. And it’s very sad to see. I think the massacre of the innocents must obviously apply to both sides. The Israeli dead have an equal right to that claim. But the scale — I mean, “disproportionate” is not the word for it — the scale of the response is obscene. Even a small example, I’ll give you. Yesterday, something fell out of the sky over a small area of Beirut called Qurashim [sic]. I think it was part of the wing, the wingtip of an F-16. The Israelis say it’s not, but I think it probably was. And it crashed in a fiery volcano glow and burned trees, bushes, the roadway, and decapitated a young man in his car who was driving home to his family. I got there in about eight minutes. And there were three very friendly Lebanese soldiers. By chance, I knew one of them, the sergeant, who said, “Mr. Robert, you must be very careful. The Israelis will come back and bomb again, but we’ll take you into the fire and show you as much as we can.” And they stood around me and protected me as we went up the road for about a mile walking — or running, to be very honest with you, because Mr. Fisk here is not a very brave warrior. And I saw parts of what appears to be a wing. I think it was burning fuel all over the road. I think it came out of whatever the aircraft was. I think what actually happened is a Hezbollah missile probably hit an F-16, and the Israelis didn’t want to claim it. They said that it was part of a barrel containing propaganda pamphlets and leaflets, which — well, I didn’t see leaflets anyway, and I know they burn on fuel, but anyway, I saw what I could and got away afterwards and said, you know, waved at the soldiers and thanked them. And the Israelis did come back some hours later and bombed the barracks of these soldiers, which were members of a logistics unit. Their job was to repair bridges and electrical lines. They weren’t combat soldiers. And they killed ten Lebanese soldiers, including the three young men who had protected me the previous day. This was outrageous, because the Israelis know what each individual Lebanese army unit is doing. They know if it’s a combat unit, armored personnel carriers, helicopters, whatever. And they picked on this sole barracks to destroy those men, to exterminate them, because, of course, their job was to keep Beirut alive, to keep the power systems running, to repair the bridges which were being destroyed — 46 bridges now, according to Minister of Finance, who told me this a few hours ago, have been destroyed in Lebanon. This is the inheritance, of course, of former prime minister, assassinated prime minister Rafik Hariri, who was murdered on the 14th of February last year. He rebuilt this country. He rebuilt the city of Beirut. Now, bit by bit the bridges, the lighthouse, the international airport are being destroyed. AMY GOODMAN: When Robert Fisk was almost killed by an angry Afghan mob, when he was covering the war in Afghanistan, Rafik Hariri called him after he had gotten out of that situation, almost died, and asked if he could send a plane. But Robert Fisk said he felt that was inappropriate to receive anything from a government or former government official. Well, on Tuesday the Lebanese prime minister said Israel’s opening the gates of hell and madness in his country and urged Hezbollah to release the two captured Israeli soldiers, but said Israel’s response has been disproportionate. I asked Robert Fisk about the Prime Minister’s comments. ROBERT FISK: You know, I know Fouad Siniora, the Lebanese prime minister, quite well, and I like him very much. And he’s a very affable, friendly and honorable man, but his response has been pretty pathetic. You know, to call the Israeli response “disproportionate” is to go along with the European, the E.U.’s equally pusillanimous response. Roaring on about gates of hell is not something that Lebanese prime ministers can do. He appeared on television not long ago crying, which I don’t think Winston Churchill was doing in May of 1940. But he’s not Rafik Hariri and never claimed to be. He’s an economist, not a professional politician. The usual problem — I mean, the moment the attack took place, the Israelis blamed the Lebanese government, who can’t even control a water faucet, let alone a Hezbollah militia man. And that, by saying the Lebanese were responsible, gave them the excuse to start destroying the infrastructure of Lebanon. Even the beautiful new viaduct that Hariri had built on the transnational highway to Syria has been broken by the Israeli bomber strikes. I’ve been there and seen it and stood on it. You know, what it needs is a government, which — there’s no power in the Lebanese army. It’s 50,000 strong, but they can’t defend Lebanon. And there’s only three Vietnam-era helicopters or some ancient hawk hunter fighters belonging to Lebanon. They can’t fight off the Israelis. But, you know, I asked tonight, for example, the Minister of Finance whether he’s considered suing the major American armaments manufacturers, who are producing the missiles, who are killing all of these innocent people here. And he hadn’t thought of it. You know, I mean, most of the missiles which are landing here are made in Seattle and in Miami, Florida, by Lockheed Martin or Boeing. But it’s as if you’ve got this little tiny parish council, you know, parish pump government. And they talk about the gates of hell, and then they talk about disproportionate, and then they cry. I’m afraid that’s not a way to run a country. But Lebanon is a very small weak country, and Israel is a nuclear-powered superpower, nuclear-armed superpower; what can you do? AMY GOODMAN: Robert Fisk speaking from his home in Beirut late Tuesday night. We’ll come back to the interview in a minute. AMY GOODMAN: We return to our interview with Robert Fisk, chief Middle East correspondent for the London Independent. I reached him at his home late last night in Beirut, where he has lived for almost three decades. I asked him about the World Health Organization’s announcement Monday that it expects the number of Lebanese residents displaced from their homes to reach 900,000. ROBERT FISK: I think it’s probably a little bit less than 900,000, but it’s probably moving towards half a million. I mean, the people from the southern suburbs, where, of course, the Hezbollah did have their headquarters — “did” being the optimum word now — there are about half a million of them scattered across Beirut in schools, public parks. They’re living out in the open in parks, where it’s warm, but what a filthy place to live, under trees on dried grass. I mean, this is a mass punishment of a whole people for the actions of a very ruthless, powerful guerilla army, Hezbollah, which does not represent the Lebanese people. Anyway, it is important to remember that the Hezbollah crossed that border against all international law. No one gave them a referendum or a vote to cross the border and kill Israelis and capture two Israelis and start off this war. But, you see, they relied upon — they totally relied upon the cruelty of Israel’s response. And Israel, as usual, obliged them. So no one will now criticize the Hezbollah in Lebanon. But it’s a catastrophe, because here is a country that began to believe in itself again after the years of civil war, and now it’s the same old story. The country is being vandalized and smashed up by a country which says it believes in purity of arms. And these civilian deaths, I don’t believe that they’re by chance. I don’t believe it was a mistake when they hit that army barracks of logistic soldiers, who are trying to repair their own country, which they have every right to do. And Marwaheen is a particular — this is a village in Southern Lebanon, where Mossad, the Israelis, ordered the villagers out. I should add that this is a village closest to the scene of the killing and capture of the Israeli soldiers on Wednesday. They were ordered to leave the village. They did so in a convoy of cars, 20 of them. They went to the United Nations, who ordered them away — Ghanaian Battalion, shamefully — and set off to Tyre. And an F-16 came down and burned them all alive with bombs. Outrageous massacre. The Israelis keep boasting that they are picture-perfect, punctilious, surgical strike operations. Well, if that’s true, then that was mass murder and a war crime; if it’s not true, then we can’t believe in the riffraff of the Israeli Air Force anymore — it’s as simple as that — or the riffraff of the Hezbollah, if you listen to some of their roaring, by the way. But one has to be as cynical and as critical as one wants in a war, because no one else will be, usually. AMY GOODMAN: Robert Fisk speaking to us from his home in Beirut. On Tuesday, we broadcast an interview with Syrian President Bashar Al-Asad, and I asked Robert Fisk about this. But I want to play for you just an excerpt of that interview that we played yesterday, done by independent journalist Reese Erlich in Damascus. Erlich asked President Asad about whether Syria plans to demarcate its borders with Lebanon or open embassies between the two. PRESIDENT BASHAR AL-ASAD: The first part about the borders, we had a letter, formal letter, from the Lebanese prime minister, and we sent him a reply, formal reply, that we are ready to demarcate the borders. We don’t have any problem, because we had such a problem with Jordan a few years ago, and we solved it. About the embassies, as a concept, we cannot say we don’t want to have an embassy in another country, as a concept, but that needs normal relation. Now, we don’t have this normal relation with the Lebanese, so it needs better relation to discuss this issue. REESE ERLICH: What kinds of issues would have to be resolved in order to have a normal relation? PRESIDENT BASHAR AL-ASAD: First of all, not to have a government that works against your country. This is first of all. And second of all, you need the Syrians to feel that they have real neighbors, not cradle for or not a hub for terrorists to come and do such terrorist acts in Syria. REESE ERLICH: One last question, what would it take to improve relations between the United States and Syria now? Are there any steps that could be taken that would improve them? PRESIDENT BASHAR AL-ASAD: Definitely by the United States, not by Syria, because we did a lot, and we couldn’t get any result, because they don’t have the will. So first of all, they should know and they should understand the situation in the region. They should appreciate the role of Syria in the region. They should know that we have common interests that they don’t see. And I think they should be neutral in dealing with our causes. That’s how we can get back our relation to normal. AMY GOODMAN: Syrian President Bashar Al-Asad speaking with independent journalist Reese Erlich last month in Damascus. The full interview is available on our website at democracynow.org. Well, during our conversation yesterday with journalist Robert Fisk, I asked him about what role he thinks Syria and Iran are playing in the current crisis. ROBERT FISK: They are behind all of it. Look, last year under U.N. Security Council Resolution 1559, Bashar Al-Asad, the President of Syria, was forced to make a very humiliating military withdrawal of his army from Lebanon. Since then, he’s been constantly condemned by the State Department, the Pentagon, the White House, Israel, of course, as a bastion of evil, as helping the insurgents of Iraq, which up to a point I think he probably does. And Lebanon has been allowed to believe, especially by the U.S. ambassador here, Feltman, who is now mutely and pusillanimously silent, that it was a democracy, that it won its freedom in “Cedar’s Revolution,” remember, from last year, which is actually a fake one, in quotation. It wasn’t made up by the Lebanese. And now, suddenly this democracy counts for nothing, because, of course, what President Asad has done effectively is say, “Look, you may think you have your little seat of democracy over there, but I control events.” Syria is the chief supporter politically of the Hezbollah. And Iran is the chief supporter military of the Hezbollah. And this is Syria’s work. This is Syria saying, “We’re back. We control events. Negotiate over the occupied Golan Heights.” And as usual, poor old Lebanon and the poor old Lebanese are paying the price for it. But you need to realize this was planned a long time ago. No one suddenly got up in the morning and ate their hummus and had some coffee and said, “Let’s fire a missile at a warship.” The tele-guided missile attack on a major Israeli naval vessel had been planned a long time in advance. And militarily for the Hezbollah, it was an enormous success. It set the vessel on — the ship set on fire for hours, and four sailors were blown overboard. And since then, I have to tell you, I’ve only seen one gunboat off the coast of Lebanon, and that was miles away. They don’t come in close anymore, not at least during daylight hours. There’s another point which the Israelis have not talked about, because it’s under strict censorship in Israel, that the Hezbollah, who had weeks earlier sent a pilot-less reconnaissance drone over Israel, made, of course, in Iran, taking pictures, they had identified the headquarters of Israel’s top secret military air traffic control center at Miron in Northern Israel. This is basically where the military scientists are based. It’s like caves in a mountain. They’re untouchable. But the drone identified the antenna on the top of the mountain and put missiles onto it. Israel has a secret code name of Operation Apollo. Now, this was an extraordinary breech of Israeli security. Never, insofar as I know, since the ’73 war, has it been breeched like this. And now, of course, now we’re having these constant flurries of Zalzal-2 missiles onto Haifa, an amazing situation, which, of course, is frightening, or not frightening, but is deeply concerning, worrying to the Israeli security people. AMY GOODMAN: I went on to ask Robert Fisk about Hezbollah and the reaction in Lebanon to their capturing the two Israeli soldiers, which sparked the current crisis. Hezbollah has called for a prisoner swap with Israel, and many in the Arab world see their act as having been in solidarity with Hamas taking a soldier hostage in Gaza last month. I asked Robert Fisk to respond. ROBERT FISK: Obviously, Hezbollah knew when they carried out this attack across the border on Wednesday that the soldier had been captured and taken into the Gaza Strip. But I think it’s expecting a bit much in terms of coordination to assume that this was some massive plot by both Hamas and Hezbollah. I don’t believe so for a moment. No, initially the Lebanese reaction was great fury at Hezbollah, because they realized that all of these enormous forward movements of the country, the infrastructure, the money, the security, the safety, had had all been thrown away. But the Hezbollah, as I said, had obviously relied upon the cruelty of the Israeli response, the extent of the cruelty of it, to make sure that at the end no one was going criticize Hezbollah. And as I say, the Israelis obliged. Their response has been outrageous. It has been obscene. And, you know, this is — we’ve now got more dead than we had in ’96, when the Qana massacre happened, many more dead than in ’93. Now, it’s not the same as, for example, the 1982 invasion of Lebanon, where 17,500 people were killed. We’re only talking about just over almost 250. But, nonetheless, many Lebanese now, you see, don’t have an experience of that civil war and that area of invasion. They’re young. Many Lebanese during the civil war were sent away to be educated in Harvard, New York, London, Geneva, Paris. And they came back believing in a new world, in the West. And they’re suddenly seeing what Israel is doing, and it is shattering. And when they look around and ask what the Americans are doing, well, the Americans are evacuating their precious American citizens, and the British are evacuating their precious English British citizens, and the French — and so on. We’re more concerned about the lives of our beautiful blue-eyed white people than we are about the poor old Lebanese. And this is a big problem, you know, because the Lebanese are a very sophisticated people. They look like us. They feel like us. They speak foreign languages. They’re much more better educated than most Westerners. And we don’t care about them. We don’t care about them. AMY GOODMAN: Finally, Robert Fisk went on to talk about the media coverage of the current crisis and reporters embedded in the Israeli military. ROBERT FISK: There were reporters embedded in the Israeli navy, watching them shell the coast of Lebanon, and I’ve seen the footage. Then, suddenly, one of those Hetz-class gunboats is hit by an Iranian missile. And within a minute, Hezbollah’s television station, Al-Manar, which has been totally bombed, pulverized, pound into dust — it’s still broadcasting presumably from bunkers elsewhere in Beirut — suddenly shows all the embedded footage on television, like “Here’s the ship. Here it is firing on Southern Lebanon. This is the ship we hit.” Extraordinary bit of propaganda. I mean, absolutely amazing, outrageously so. How on earth did they have those pictures aligned and ready to put out on the air within a few minutes of the attack on the gunboat? You know, Nasrallah came on television in Beirut within minutes after the Israelis had bombed his home and tried to kill him and, of course, failed to do so, saying, “You don’t have to worry about me, but go out onto the beach of Beirut and look out to sea, and you’ll see the ship burning.” My goodness me, that was a stunning piece of propaganda. But, of course, the embedded reporters, as usual, will do their job in extolling, I’m sure, the surgical strikes of the Israelis, “as usual.” I put that in quotation marks. But, you know, there is an awful lot of propaganda roaring on and on. I get very tired of watching Nasrallah saying it will be all-out war, we have more surprises, etc. And then Ehud Olmert says we may have a full-scale land invasion of Lebanon, which is absolute tosh. He has no intention of doing that. He’d lose hundreds of men if he did such a thing. And there are all these sort — I call them the roarers, you know. Nasrallah and Ehud Olmert are now trying to outdo each other in all kinds of terror language. I’m constantly reminded of that wonderful line in King Lear, where he says, “I shall do such things I know not, but they shall be the terrors of the earth.” I’m contemplating a piece on the roarers of the Middle East. Ahmadinejad, the President of Iran, is another roarer. And, of course, the worst thing is that they say this, so that the Western press will pick it up. And heaven spare us all, the Western journalists do pick it up and use it. You know, they’re looking for a good line, as if this is a football match or football game or a hockey match, instead of a tragic war which is taking the lives of people like that little girl in the field. AMY GOODMAN: Robert Fisk, chief Middle East correspondent for the London Independent. He’s covered the Middle East for the last three decades. He was speaking from his home late last night in Beirut, Lebanon.